Why Use QuickBooks Memorized Transactions? Entering a new transaction from the memorized transaction list means that most or all of the data to be tagged to that transaction will be pre-populated the next time you need a similar transaction. QuickBooks will remind you that its time to enter an automated memorized transaction and with one click choose to enter (or skip it). 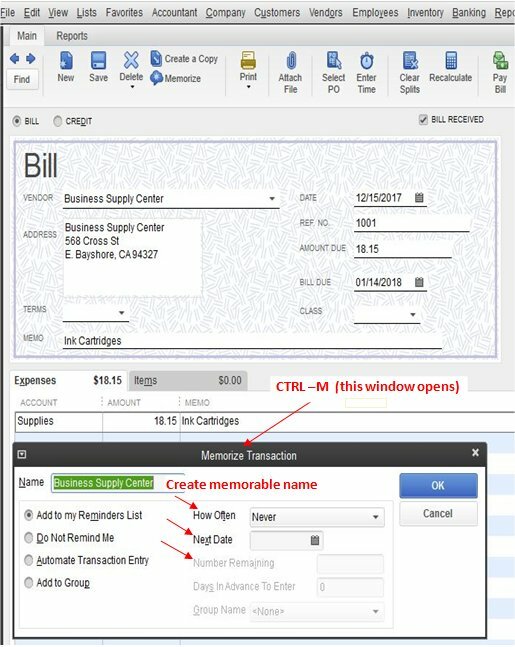 QuickBooks Online uses another name for the QuickBooks Memorized Transactions called Recurring Transactions which can be found under the big gear in the top right of the browser. Step 1- memorizing a recurring transaction. Press Control + M or from the Edit menu select Memorize. Give the memorized transaction a name that will help you recognize the transaction. QuickBooks will return you to the transaction you started to create the template. Next decide if you should clear the screen or do you want this transaction saved (in addition to it being memorized). If so, save it, otherwise, click the clear button . 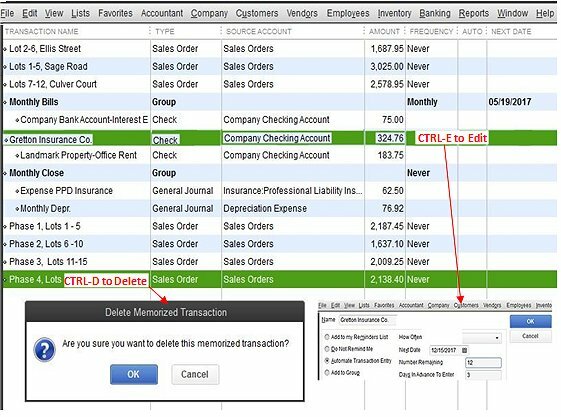 Deleted a QuickBooks memorized transaction that is no longer needed- highlight and delete the transaction (Control + D). To keep the transaction on the list but not automated, or to change the number remaining or the frequency of how often the transaction should be created, simply highlight the transaction from the memorized transaction list and right click and edit OR (Control + E). ; make needed changes and press OK. Occasionally, there may be a need to change the dollar amounts within a memorized transaction; from the memorized transaction List window (Control + T). Highlight and enter the transaction. Change the information that needs modifying. Control + M to RE-memorize, and from the pop-up window, click on replace transaction. Be sure to clear the Transaction window. Return to the memorized list (Control + T) and review the settings of the memorized transaction (highlight and edit –Control + E -to edit right click on the mouse and select edit). Change any information required for the scheduling of the transaction and click OK. 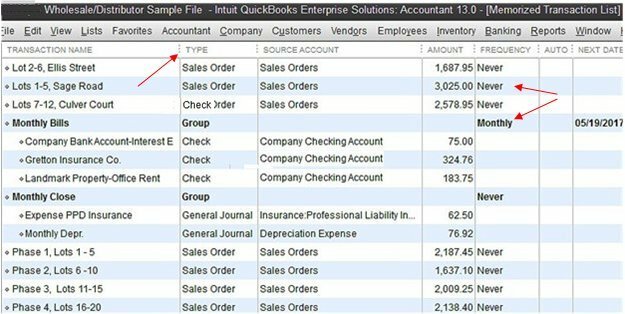 In QuickBooks, these transaction types cannot be memorized: payroll checks, time records, bill payments, sales tax payments or receipts or deposits of payments. If you need help making or correcting memorized transactions call 800-216-0763 to talk to one of our QuickBooks experts. We can solve many problems using remote access, telephone or e-mail support. Need help? Expert QuickBooks Support!